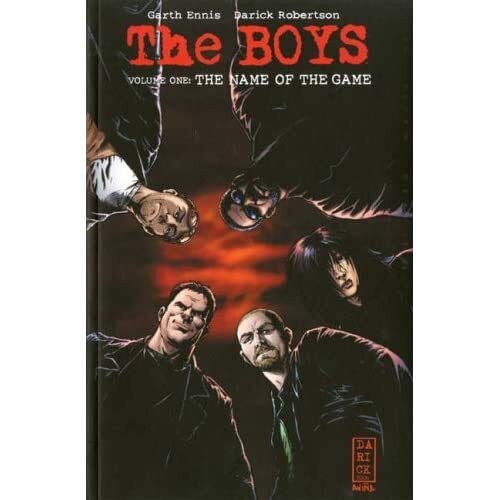 So I picked up the first trade paperback of The Boys on a total whim. I wanted a new comic and this one looked fairly interesting. It ended up being the best impulse buy ever! It’s dark, it’s gritty, it’s violent, and it has a point of view. Perfect! The story centers around, well obviously, The Boys, which consists of Billy Butcher (who is out for revenge after a “supe” kills his wife), The Frenchman (who is a bomb sniffer and homicidal maniac), The Female (who lives to rip peoples faces off), Mother’s Milk (a snob and brains of the group), and Wee Hughie (the new guy). And these are the good guys. Superheros, according to the story, were created due to government tests of “Compound V”, which then got into the gene pool and is now a relatively common phenomenon. The Supes are egomaniacal, spandex wearing, self-interested megalomaniacs, and comic books are actual biographies of the current superheros. They have merchandising and P.R agents, and absolutely no interest in humanity other than as a photo op. The Boys have also taken the compound and are working under the CIA to police the Supes. If you haven’t bought this, do it now (although if you have a weak stomach or are offended easily, this is probably not for you)!!! Amazon is going to love me this month with all my comic book buys, but what the hell. It’s autumn. Take one large avocado, peel and de-stone. Mash in a bowl. Squeeze a lime into it, add a bit of salt and pepper, mix. Dice about 4 large cherry tomatos, half a large onion, and mince a large clove of garlic. Add to avocado mix. Then add chipotle Tabasco until it’s hot enough for you (jalapeno Tabasco is also really good here). Now this is the most important part. It will not taste right at first. You need to let it sit for at least 30 minutes or you’re just wasting your time. I know, it’s hard, but your life will be better for it, trust me! Crack open beer, open bag of chips, get book, and enjoy!